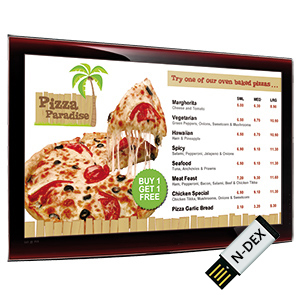 The N-Dex digital poster system is a combined hardware and software solution. Its powerful and easy to use software allows users to display images and text. You can add or change the content displayed at will. Our N-dex digital posters work with projectors, video monitors, TVs and of course our fantastic range of slimline display screens. For further details please download the N-Dex Digital Poster System information sheet (PDF). For further details please go to the DOWNLOADS page to download the product brochure in PDF format or contact AMT Media by email or phone. AMT Media | Powered by Mantra & WordPress.